Do I Love Dungeness Crab? Indeed I Do! 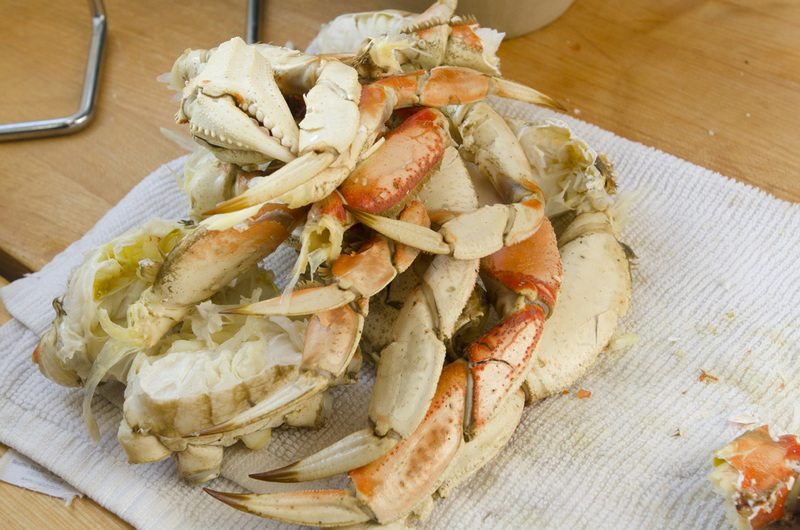 This seemed to have been a bountiful late winter catch of Dungeness crab. We had a great dinner of crab, sour dough, and salad in San Francisco and then found them stacked in our local Whole Foods quite frequently once we returned home. Although I love them steamed, cooled down, and picked right at the table, I also love them in cioppino, a traditional San Fancisco shellfish stew that I grew up with. It is similar to all Mediterranean fish stews in that you can make it with almost any combination of fish and shellfish you like and in any base, although tomato is almost always the defining flavor. I only use shellfish ‘cause Steve is allergic to fish with scales. If you can find the crab, make the stew; it is everything you want an aromatic stew to be. Heat the olive oil in a soup pot over medium heat. Add the garlic, onion, carrot, and fennel and cook, stirring frequently, for about 5 minutes or until the vegetables begin to soften. Add the wine and cook for about 10 minutes or until most of the alcohol has burned off. Stir in the tomatoes, along with their juices, and the clam juice. Bring to a simmer. Stir in the basil and parsley and season with salt and pepper to taste. Cook at a low simmer for 15 minutes or until the flavors have blended nicely. Add the crab pieces, clams, mussels, and shrimp. Cover and cook for about 10 minutes or until the shellfish is cooked and the shells have opened. Ladle into individual shallow soup bowls or one large soup tureen. Garnish with parsley and serve with warm sour dough bread, if desired. the stew sounds delicious! i love crab! It is absolutely delicious – try it! 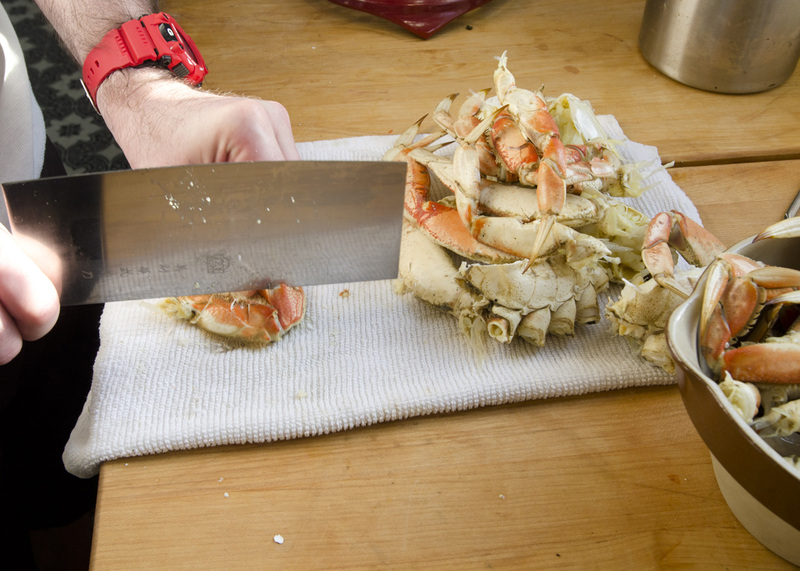 While stew is simmering, hack crab leg through shell into 2- to 3-inch pieces with a large heavy knife. Add crab pieces and clams to stew and simmer, covered, until clams just open, 5 to 10 minutes, checking every minute after 5 minutes and transferring opened clams to a bowl with tongs or a slotted spoon. (Discard any unopened clams after 10 minutes.) Lightly season fish fillets, shrimp, and scallops with salt and add to stew, then simmer, covered, until just cooked through, about 5 minutes. Discard bay leaf, then return clams to pot and gently stir in parsley and basil. In a small bowl, combine flaked crabmeat, swiss cheese, sour cream, onions, lemon juice Worcestershire sauce, water chestnuts and salt; set aside. Preheat oven to 400 degrees. Spoon about 2 teaspoons crabmeat mixture evenly onto each slice of bread. Arrange on an ungreased baking sheet. Bake 10 to 15 minutes until bubbly and slightly browned. Serve hot.